I know it’s early. I know I shouldn’t jinx it. 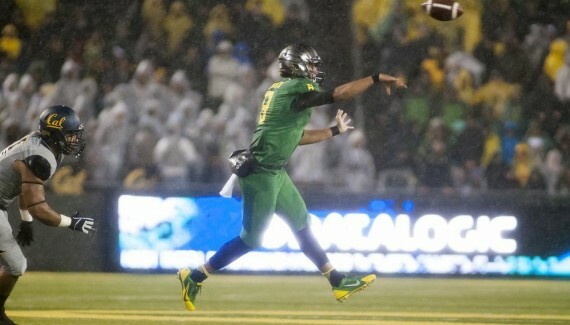 But Oregon quarterback Marcus Mariota is off to one heck of a start this season. Through only five games, he’s posted 1,358 passing yards, no interceptions, 338 rushing yards and 21 total touchdowns in leading the Ducks to a 5-0 start. The Mariota-led offense has posted more than 55 points in each game this season, a new school record. The sixth week of the season is a bit early to start looking at the Heisman race. Players from all over the country could easily emerge as frontrunners as conference play picks up. Still, Oregon fans cannot help but get excited about their team’s smooth, poised sophomore leader. Since 2000, there have been a couple of Oregon quarterbacks who inserted themselves into the Heisman race. Joey Harrington was a finalist back in 2001, and Dennis Dixon was a frontrunner in 2007 before an unfortunate late-season injury. 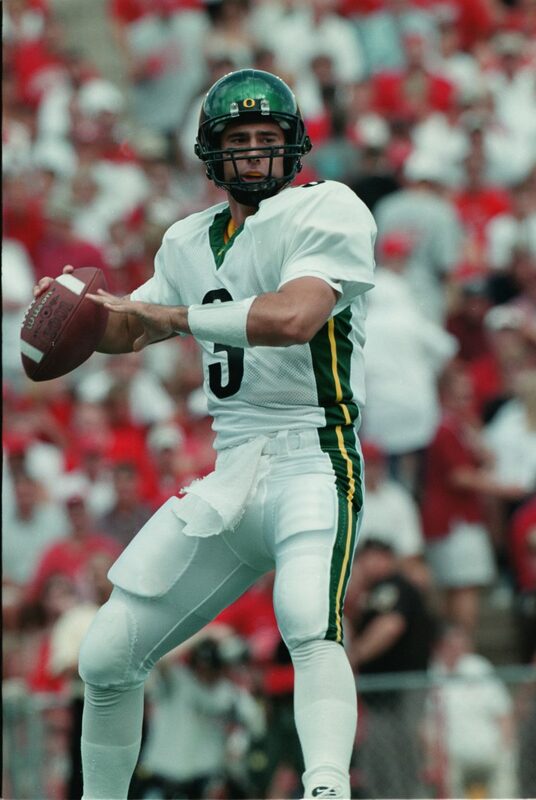 Oregon legend Joey Harrington in action. Harrington’s numbers were impressive in 2001. He completed 57.8 percent of his passes for 2,415 yards and 23 touchdowns to only five interceptions. However, he was not much of a threat on the ground, and recorded only one rushing touchdown. Over the past few years, it has become tougher to win college football’s top individual honor as a classic pocket passer. Tim Tebow, Cam Newton, Robert Griffin III and Johnny Manziel have proven that, each posting at least 10 rushing touchdowns the year they took home the statue. While Harrington did not exactly fit this mold, Dixon was certainly a dual-threat weapon in the backfield. The fast, lanky stud was arguably the best quarterback in the nation throughout the first two-thirds of the 2007 season before a truly unfortunate knee injury sidelined him late in the year. 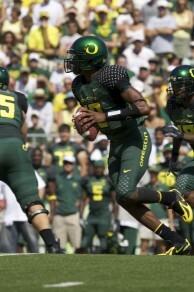 Dennis Dixon, a similar player to Mariota, was a Heisman frontrunner before an injury cut his season short in 2007. In 2007, Dixon completed 67.6 percent of his passes for 2,129 yards and 20 touchdowns to four interceptions in only 10 games. He also added 590 yards and nine scores on the ground, including that famous fake statue-of-liberty play against Michigan. If those numbers are extrapolated through a full 13 game season, they come out to be 2,767 passing yards, 26 touchdowns, 767 rushing yards and 11 rushing touchdowns. Those numbers are comparable to those of Tebow, the 2007 winner, and Dixon would have almost certainly been a finalist had he played the full season. 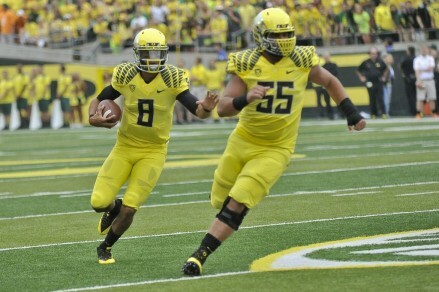 Entering the 2013 campaign, there was a pair of Ducks that many considered high up on the Heisman list. De’Anthony Thomas has unfortunately missed a pair of games due to injury, but Mariota has emerged as a favorite through five games. The Flyin’ Hawaiian has dominated his competition thus far. If his numbers are extended to a 12-game season, which is conservative because it excludes a potential conference championship game, he would finish with 3,259 passing yards, 33 passing touchdowns, 811 rushing yards, and 17 rushing touchdowns. These passing numbers alone far exceed those of Harrington back in 2001. When you factor in the rushing projections, it is clear that Mariota is on pace for something truly special. Mariota is currently on pace for 50 total touchdowns in 12 games. Those projections give Mariota 50 total touchdowns in 12 games. Comparing that number to those of the recent dual-threat Heisman winners, things get very exciting. During the same 12-game regular season, Tebow recorded 51 total touchdowns in 2007, Newton had 49 in 2010, RGIII had 45 in 2011, and Johnny F. had 43 last year. To put things into perspective, there are only five current quarterbacks, aside from Mariota, who are on pace to eclipse 800 yards rushing this season — Taysom Hill of BYU, Jordan Lynch of Northern Illinois, Keenan Reynolds of Navy, Cole Gautsche of New Mexico, and the Pac-12’s own B.J. Denker of Arizona. However, none of these players comes close to reaching the passing totals of Mariota so far this year. Lynch is the only one even in the same ballpark, and he is on pace for fewer than 2,700 yards. This makes Mariota the only player (including Manziel) currently on pace for more than 3,000 passing yards and 800 rushing yards. The lone blemish on the sophomore quarterback’s stat line is his 56.7 completion percentage. However, Oregon’s game against Cal was played in an almost comically-large rainstorm, and considering the fact that no one could hold onto the ball during the game, completing 11 of 25 passes does not seem too bad. On top of this, Harrington only completed 57 percent of his passes in 2001 and was still a finalist. Mariota’s lack of interceptions so far in 2013, coupled with his ability to protect the ball, also make up for his relatively low completion percentage. Mariota is the only current player on pace for more than 3,000 yards passing and 800 yards rushing, in 2013. While all of these projections are exciting, they are just that – projections. Mariota has yet to face a great opponent (though Tennessee sure did give Georgia a hard time this past weekend), but the schedule really picks up in the next few weeks. Oregon travels to take on Washington in Seattle, then returns home to host Washington State and UCLA before the big one at Stanford. Still, the increased strength of schedule could actually benefit Mariota’s numbers. Mark Helfrich has been pulling his quarterback early due to big leads. In fact, he has yet to even attempt a single pass in the fourth quarter. With the numbers he’s already been able to put up, that is a scary thought. There are so many factors that go into a college football season, and as we fans know, anything can happen. With that said, Mariota appears to be in store for something special this season, especially after that seven-touchdown performance against Colorado. If Mariota can lead his team over the hump and out of November without a loss, voters will have a hard time keeping the Heisman out of his hands.